The parish of Didlington is situated in southern Norfolk, to the west of Ickburgh. Its name comes from the Old English ‘Enclosure of Duddel’s people’. The parish has a long history, and was certainly well established by the time of the Norman Conquest, its land ownerships, population and productive capabilities being listed in the Domesday Book of 1086. The earliest evidence of human activity in the parish comes in the form of a Palaeolithic flint axe (NHER 4815). 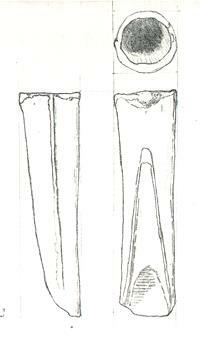 Mesolithic flint tools have not been found, but Neolithic flint examples include a spearhead (NHER 4816), a lancehead (NHER 11421) and a scraper (NHER 14000). There is just the one find from the Bronze Age, a copper alloy socketed gouge (NHER 20897), but the remains of a burial mound or barrow from the period have been identified from aerial photographs (NHER 11417). The Iron Age is represented only by pottery fragments (NHER 4819), as is the time of the Roman occupation (from the same site), together with a bracelet, brooch and coins (NHER 28559). There are no finds at all from Saxon times. The medieval period following the Norman Conquest has left the parish with its oldest surviving building, St Michael’s church (NHER 4833). This mainly 14th century building consists of a west tower with an aisled nave and chancel, and was heavily restored in the late 19th century by the Amherst family of Didlington Hall (see below). However, the 14th century Purbeck marble font and a 14th century piscina remain inside. Other medieval buildings have not survived, and indeed two whole villages in the parish have disappeared. Colveston deserted village (NHER 1040) had gone by the 18th century, and its church, visible today as an overgrown mound in the middle of a field, was in ruins in the 17th century. Didlington deserted village (NHER 11758) was mentioned in the Domesday Book, but fell into decline in the 17th century as the Lord of the Manor bought up the arable land. Today, the outlines of some house foundations can be seen from the air. A rectangular enclosure identified from aerial photography (NHER 29627) may have been associated with Colveston village. Of the buildings from the post medieval period, probably the oldest to survive is West Hall (NHER 11416), which dates to the 16th century (with later additions), and has reused medieval timbers and stonework. Inside, there is a fine 17th century staircase. Didlington Hall (NHER 4821) was a 17th century mansion, later extended and then greatly enlarged in the Italian style by Lord Amherst in 1856. One of the great halls of the time, it was visited by royalty on several occasions. Sadly, after military use in World War Two, the hall itself was demolished in 1950. However, the extensive grounds remain (NHER 40234), with lakes, a boathouse (NHER 40235), an ice house (NHER 34562), now used as a bat sanctuary), a folly (NHER 4835) and many other features, including an engine house containing what is thought to be an early hydroelectric plant (NHER 4834). The stable range also remains, and is now the main residence. Other post medieval features include Falconer’s Lodge (NHER 40826), a 19th century hunting lodge, and a 19th century duck decoy pond (NHER 32741), now slightly overgrown. Some post medieval features have not survived: a windmill (NHER 16205) marked on 19th century maps has now disappeared, as has a kiln from the same time (NHER 4832). North of Home farm stands the most historically recent record in the parish, a World War Two type 22 hexagonal concrete pillbox (NHER 31605). The type 22 was the most common pillbox to be built as part of the anti invasion defences of 1940, but this is a rare variant, with lumps on the roof to disrupt its outline.